Transparent. doesn't stand out as much as coloured. Red, they shoot quicker. But yellow look more hip unlike casual blue. Orange is the new black. This thread needs a poll, I was just about to start one myself, but id not like to give the impression I was taking the piss out of rebel. Green are more economical though. 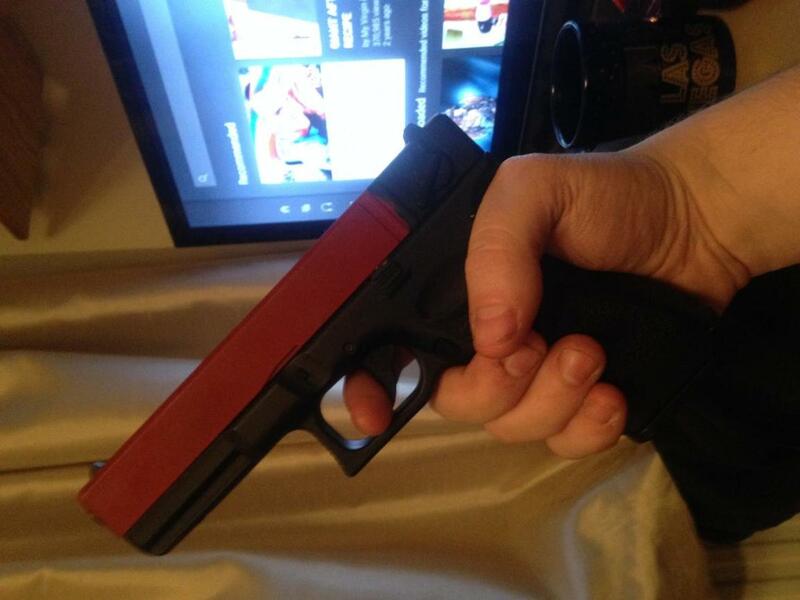 I like the barrel in red to go faster but keep the receiver and grip painted blue so it runs cooler. believe it or not. RED. Can't remember what member have a red two tone in his profile pic, and I think he kept using it even after he got his UKARA. Unless I am mistaken, which I may well be, blue is not a legal two tone colour. The problem is that it is moulded transparent thou, meaning you cant sand it off when you legally can do so. 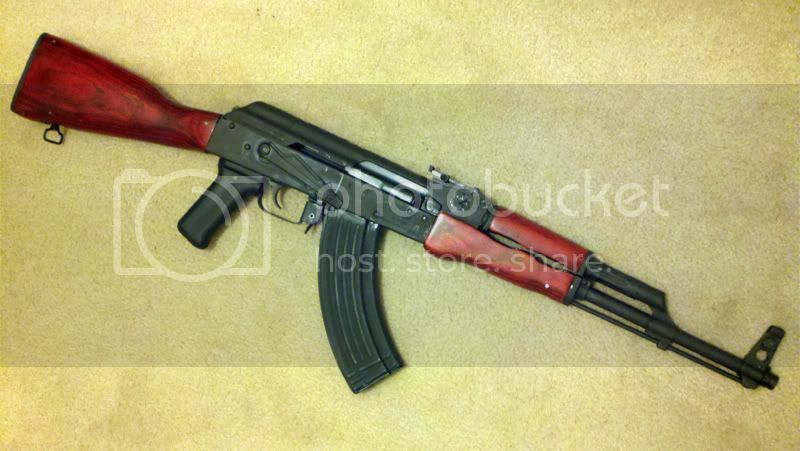 A friend of mine had a G&G RK47 a few years ago and the 'wood' furniture was sprayed red, looked really nice actually. 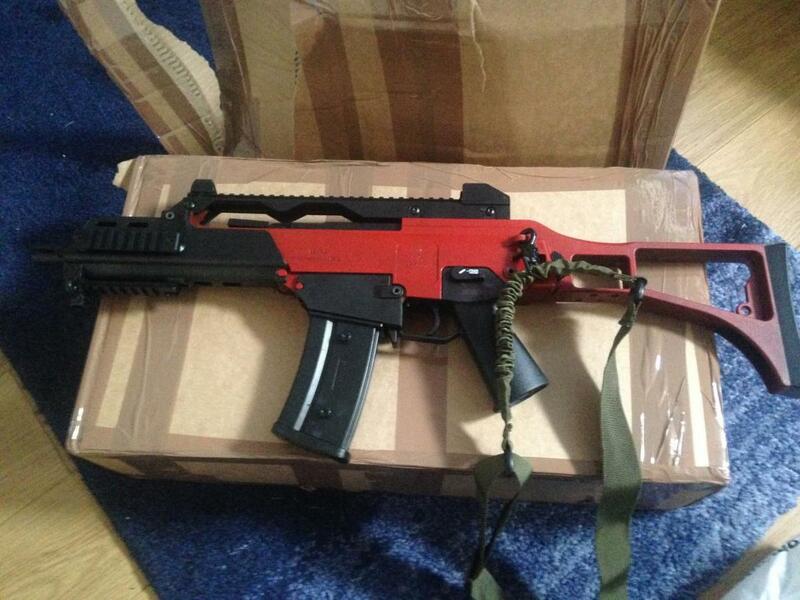 Both of my guns are two-tone red from Patrol Base. The red they used is quite dark and not at all offensive like some two-tone sprays I've seen. On a serious note, my guns are (ok! I lie! 'Were') red, and it does look alright, I didn't mind it being red to be honest. I'm sorry, there was not a paragraph below it to quote a definition of bright. Battery was out and the clip was empty. My Mrs won't even let me put the batteries in while in the house lol. Though I was only kidding (and still am).... non of what you said is a satisfactory defence. Plus you neglected to state whether the spring was forward/back and whether the chamber was empty. Besides, the whole point of [mentioning] trigger discipline is not whether you "had an excuse" for the finger on the trigger, it's that you (likely) did not think about it at the time. Personally like the transparent tone more, but the red is the least offensive coloured option. Just get any and wash the paint off.